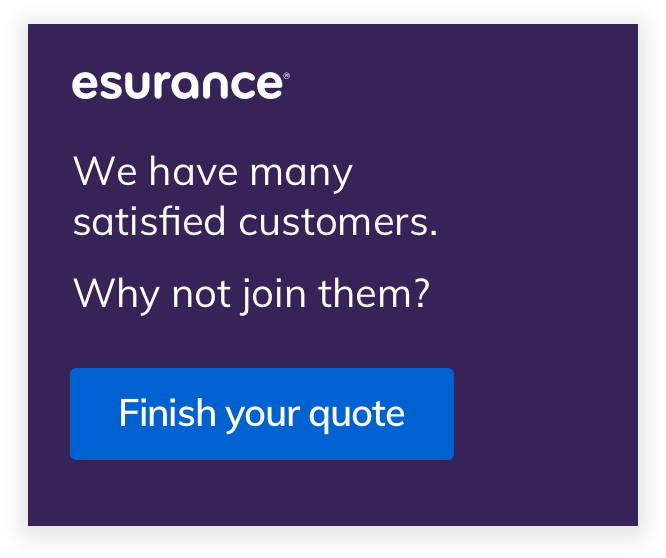 Esurance repositioning defined its mission as an insurer that uses technology and innovation to deliver a simple, transparent and affordable experience. We transformed the brand and documented it in a sharable web resource that ensures brand consistency and recognition. See the brand guidelines website. Brand audit of customer touch points spanning marketing and product revealed a missed opportunity to meet customer expectations of a modern brand and build an emotional connection. Reimagine brand visual and voice standards within the context of the simple and transparent positioning and increase purchase consideration. Execute it through the website, apps, marketing emails and LPs. Design direction: mentored a team of 3 designers through brand elements and assets evolution. Collaborated cross-functionally to integrate brand guidelines in all customer touch points. Finessed color palette, typography and layout templates and created a brand documentation website. The design team started an exploration by creating several rounds of mood boards and putting them in front of marketing and product stakeholders who provided us with the consumer study and business goals perspective. Based on the feedback, we identified the direction that was the closest to the brand character, stood out from the competition and had the strongest emotional appeal. 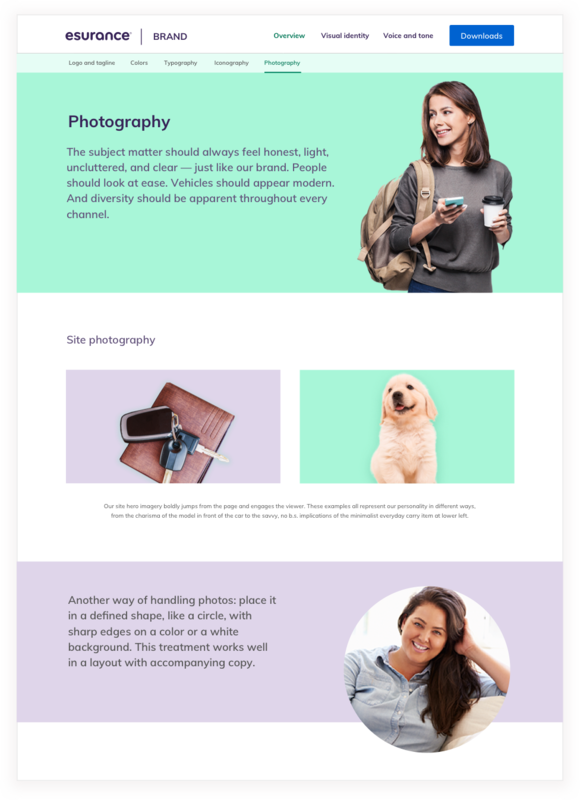 We applied A/B and moderated user testing to determine which photography and messaging style customers responded to best. We proceeded with user testing color combinations, fonts and icons though web and mobile interface components and layouts. To facilitate the proper use of the assets by in-house teams and vendor agencies we created creative.esurance.com, a style guide portal that includes the main brand elements and examples of use cases. The expanded color palette, the minimalist font face and the bright and clean illustration style brought out the brand personality and expanded user interface and interaction design options. 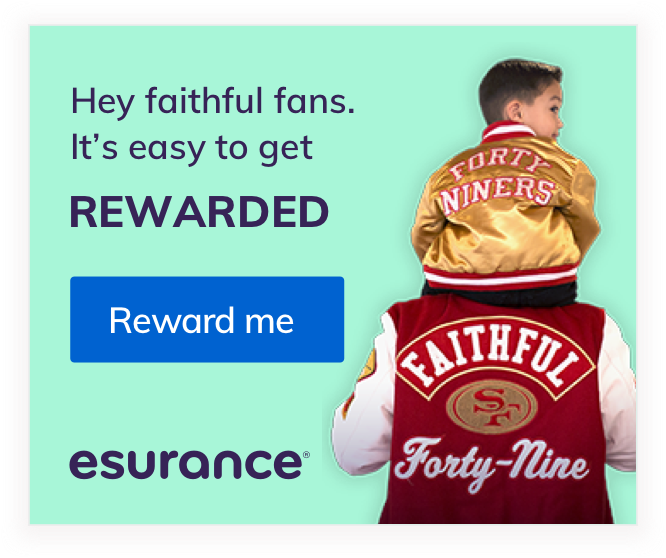 Launched through Esurance.com, a purchase app and a digital campaign the rebrand had a positive impact on marketing KPIs, especially the unaided awareness (+4%), purchase intent (+3%) and quote completion rate. The users found the homepage and quote rate pages interface and interactions based on redefined brand elements to be more clear and understandable.